Basically I may of given in to temptation in doing another project. 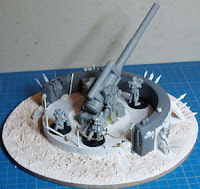 Recently I put up a post on the Earthshaker Emplacement I built sometime ago and since then I have been thinking of doing another, better, one. The plan is to build a master which can be broken down into components which I can cast. Basically it is the two dimensions shown. I don't need the entire platform dimensions, just the dimensions of the gun mount. The Hell Blades have progressed a bit more, I have added some styrene to the rear of the cockpit area so when the canopy is fitted there is no longer a gap. The one Blade has .75 added, the other had .5 added. Some GS blended them in. The planes and canopies then got a coat of Halfords Grey Primer. This is a nice undercoat for resin and will also highlight any gaps or rough areas I might of missed. The grey shows up the surface texture quite nicely I think. I also decided I really didn't like the rock on one of the bases, basically it was too big and the shape loked odd. So I ripped off the surface and hacked away at the foam beneath before adding some filler and redoing the PVA/filler/tissue covering and adding the sand. Much prefer it to the original version. ...though I haven't nailed down the colours I want them yet. Thinking a light white/off white as the base colour though. And my sodding preview button still isn't working. I decided to pluck for a project I have had half done for a while (one of far too many), namely my two Hell Blades. I do love the Hell Blade, though it probably ties with the Thunderbolt and Marauder Destroyer as my favourite 40k Aircraft. Before today these two had most of the GS done as well as the bases all done. I returned to them today to do more GS, adding the sugar/superglue (like on the War Altar of Nurgle - another project I need to finish) and to use the Dremel to add more texture to the bodywork. I will probably do a bit of tidying up here and there but otherwise the build is done - though I do need to sort the cockpits, namely sorting out the gap I have when they are in place. Well the article for Bell of Lost Souls is finally done. The writing of the article took far longer than looting the three tanks. After much editing it was still around 4500 words over three parts. I don't know when they will be going up on the website but once they are up I will post some pictures of the tanks on here. 1. The Renegade Marine ships for BFG - they have been sitting on my desk almost ready for paint since not long after Games Day. 2. Something for my CRM - it seems a long, long time since I have done anything on them so I feel I should make an effort. I have a couple of ideas of what to work on, the first an attempt to finish something I started a while back and the second is something new. So I am hoping normal service will resume on Recalcitrant Daze from now on, with updates going up regularly. PS: Am I the only one who cannot preview posts? I click the button but the damn thing doesn't want to show me a preview anymore. The Killa Kans have progressed a bit further. All six close combat weapons have been built (including distressing and re-riveting...). The first four ranged weapons are also done. Grots With Attitude. The Mob so far. I decided not to use the weapons mounted on arms, but instead mount the weapons direct to the body using the spare mounting joints from the Dreads. So for the Rokkit Launcha I used the Dread rokkit launcha but added a third rokkit (more Dakka). Pretty straightforward, just used the Dread Skorcha. I used the Kan Grotzookas but converted the second one as I can't have two identical weapons. For both of them I got rid of the scrapp in the hopper and replaced it with my own scrapp. All of the guns are removeable - the two using dread weapons just drop onto the peg while the two grotzookas are magnetised. The close combat weapons are also removeable, the two I did first (see last post) are magnetised while the other four just didn't get glued at the wrist, so the weapons pop out if required. You know, my life would be a lot easier if I just built things out of the box. Another catch up post this evening, this one dragged up from way back...well 2007/2008 anyway. At the time I planned to have a whole artillery detachment with at least a single battery of emplaced Earthshakers along with a number of smaller pieces (plus trojans, sentinel powerlifters etc). In the end I dropped it as being just a dream I would never get to fullfill (sigh...). As such the emplacement got trashed and the earthshaker (and it's sisters) got sold off. 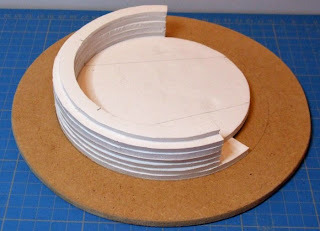 The basic structure is foamboard. It was an absolute nightmare to cut due to everything being curved. The circular recess cut into the top of the gun 'deck' is so that the gun itself could turn. The walls got a coat of filler which after sanding down received a coat of GW Roughcoat. I took the Earthshaker base panel and after much cutting and sanding had just the base of the gun itself which was then glued centrally onto a disc of 1mm styrene (the picture below shows what I mean much clearer). A larger circle of treadplate was cut which would fit into the emplacement gun deck area, The central hole is smaller than the disc of styrene and rather than gluing the two together the disc was sandwhich between more styrene which was glued to the treadplate - thus allowing the disc of styene mounting the gun to turn in position. 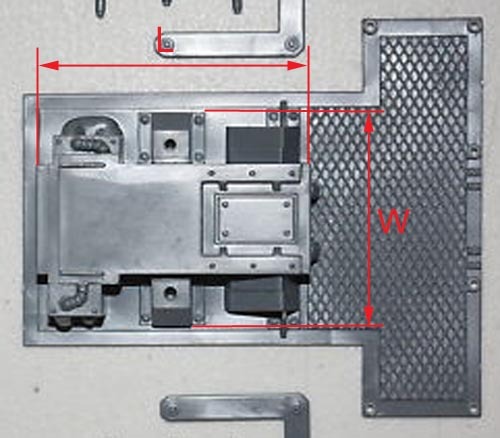 A small crank handle was added, this is the means that the crew would rotate the gun. The gun platform above was then glued into position. Some bracing, with chaos star additions were added around the curved wall to make it look a bit more interesting. At the rear more styrene was added around the base and onto the step. A chain fence was also added to stop the crew falling off the edge. The central span was removable to allow resupply to be more easily carried out. The base was then textured with a muddy feel and more detailing added to the emplacement, such as the vox unit, some stores etc. And finally we have the gun and crew in position. The crew are shown on bases but the plan was to eventually pin (or magnetise) them in place so that the bases could be removed but the crew themselves could be taken out of the emplacement as they were killed off. Overall I liked the final result, though gaming wise I am not sure how practical they would of been using a full battery of them - though having all that room to deploy infantry behind the curved wall in front of the gun would of been handy. Well as the three Looted Wagons are finally (finally) done my attention has returned to the Killa Kans I started previously. So the Kans now have legs and feet and are glued to their bases. The guy top left will need some detail doing to the bottom of his left foot. Also started working on the arms, the first two close combat arms are done. Didn't want them to look identical - plus I used the other drill bit piece on one of the Dreads. The chainblade piece is a Kromlech part from Maxmini. Will get some more done tomorrow, though I have another gig so it probably won't be enough to be worth an update. As mentioned in the previous update this weekend is the IPMS Scale Model Show in Telford, seeing as I am in Telford it seemed sensible to go along for a look. Unsurprising the show is really directed to scale modelling, something I'm not too interested if I am honest. But the materials, tools etc are just as useful for what I do do so there is plenty of things to have a look at. The models on show can also spark plenty of ideas for my own projects so I tend to take quite a few pictures. Unfortunately the timing of my visit wasn't great, basically I couldn't get to see the competition entrants they had. It is usually full of some very nice modelling projects and very good paintjobs so it was a shame I couldn't get in, but I really didn't fancy hanging around for three more hours before the judging to finish. Unfotunately no wacky camo patterns I could use for the Orks. Forge World were in attendance but I didn't see anything new on show which was a shame. It seemed this year it was just a sales stand, rather than on previous years when they have someone (such as Mark Bedford) painting their models and answering questions/doing demos etc. The only question I asked was regarding IA11. The are expecting the books to come back from the printers mid December, they hope that it will go on pre-order beginning of December but it may be beginning of January. They couldn't be any more certain than that. Happily I got away without buying any resin, for the first time ever I think. The Jag from whichever Bond film it was on. thought i'd give it a go, they also do a spray version. Another cutting tool for styene etc. Thought it was cheap enough (ten quid) to give it a go. The fact you have more control for cutting angles could be a real boon. Ok, I don't know why I bought these. They looked cute so I bought them. I don't know what I will do with them. And that is that. Decent couple of hours.